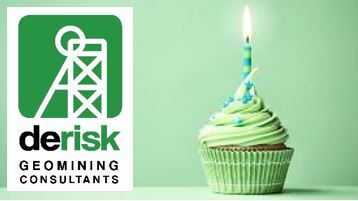 Derisk Geomining Consultants celebrated its first anniversary on 1 March 2018. In the 12 months since commencement, Derisk has secured 19 engagements with a further 6 proposals under negotiation. To date, our projects have been in Australia, Indonesia, Singapore, Malaysia, Philippines and Europe – with a focus on gold, copper, coal, nickel, base metals, tin and phosphate. Our work has included exploration reviews and valuations, drill planning and monitoring, database support, resource estimates, scoping studies, resource/reserve reconciliation, project technical reviews, preparation of independent reports and delivery of professional development workshops. We are indebted to everyone who has contributed to our progress over the past 12 months, particularly our employees, associates and clients, and we look forward to the coming year with anticipation and excitement!